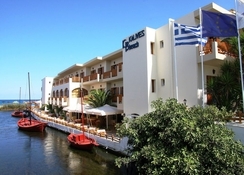 Kalyves Beach Hotel enjoys a beach-front location in Crete, Greece. As it is positioned right next to the Xydas River, guests can enjoy a fabulous view. There are plenty of rooms in the hotel, which are available in different styles. It will be a great time for the foodies, as the hotel serves all-inclusive breakfast, lunch and dinner in buffet styles. Guests can also enjoy alcoholic and non-alcoholic beverage by the pool taking advantage of the all-inclusive package. Other facilities on extra charges include Massage service, Sauna, Doctor on call, Jacuzzi, Taxi on call, Billiard and electronic games, Baby package, Beach Towels, Laptop for rent and Safe. All these facilities make this hotel a home-away-from-home for the guests. Kalyves Beach Hotel is situated in Kalyves Apokoronou, Greece. It will be an exciting time for the beach lovers and water-sport enthusiasts alike as the beach is only a few steps away. Other than this, there are plenty of bars, restaurants, shopping malls and historical attractions near the hotel. The Chania Airport is about 25.3km from the hotel. The hotel comprises bright, white and contemporary rooms that are available in numerous categories. The room types include double room mountain view, double room side sea view, double sea view blue room and superior room. Some of the facilities in the rooms include satellite TV HD LED 26 inch, refrigerator, safety deposit box, hair dryer, air conditioner, balcony or terrace, shower or bath, direct phone line, free Wi-Fi, coffee and tea making facilities, roof fan and much more. The hotel houses an all-inclusive beach restaurant and beach pool bar, where guests can enjoy unlimited amounts of food, juices and alcoholic beverages. All the dishes are prepared leveraging fresh ingredients by expert chefs. In the morning, you can have delectable American buffet breakfast while enjoying the spectacular sea view. Kalyves Beach Hotel offers wide-ranging sports and facilities that will keep the guests engaged and active throughout the day. There are two outdoor swimming pool, one indoor swimming and a children’s pool, where you can take a refreshing swim. The hotel’s fitness room will enable the guests to maintain their fitness level. Children too can have fun in the kid’s club in the hotel’s property.